Based on the novel of the same name by Frances Marion, The Wind is a powerful and haunting film of the silent, one of the last silent films released by Metro-Goldwyn-Mayer (MGM). It tells the story of Letty (Lillian Gish) who is a poor young woman traveling West by train to reach Sweet Water where her cousin’s ranch is located. From the beginning she is constantly disturbed by the howling wind of the desert as it kicks up sand and dust. On the train she befriends a man named Wirt Roddy who tells her that women are usually driven insane by the wind. Her cousin Beverly’s closest neighbors Lige Hightower and Sourdough pick her up and they begin an arduous journey to Beverly’s ranch. Wirt, her friend from the train, promises to stop by from to time. Upon arrival, Letty receives a warm welcome from her cousin Beverly and his children, but his jealous wife Cora is cold and full of envy. At a party Lige and Sourdough both make declarations of love to Letty who thinks it is just a game when they flip a coin for her. Suddenly a cyclone hits and they all file into the basement when Wirt shows up and declares his love for Letty. Angered Cora tells her to leave the ranch where she decides to go with Wirt who then admits that Letty will be his mistress because he already has a wife. Distraught Letty returns to Cora who coldly tells her to marry one of the other men so she chooses Lige. However Lige is a forceful and unloving husband who leaves her alone one day and suddenly an injured Wirt shows up. Again Wirt tries to take Letty away with him, this time much more aggressively. However, Letty picks up a revolver to defend herself and shoots Wirt burying his body out in the sand. Later that day, Letty is haunted by the wind as it uncovers Wirt’s body outside. When Lige finally returns, she confesses to him but when he looks there is no body to be seen. He tells her that the wind has the ability to hide a body if the killing is justified. Lige also says he has enough money to send Letty away if she likes, but she says she would rather stay with him because she is not afraid of the wind anymore. The film was shot in the Mohave Desert and it rarely fell below 120 degree weather as they shot the film. Lillian Gish once burned her hand touching a door knob on the set. In order to get the effects just right for the bustling wind, they had eight large plane propellers blowing sand onto the set. 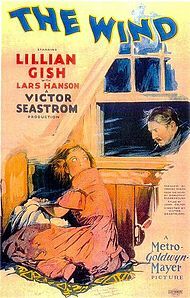 The idea for the film came from Lillian Gish from the novel and she personally hired Victor Sjostrom (anglicized as “Seastrom”) herself after working with him previously in films like The Scarlet Letter. MGM demanded they use a happier ending than the novel’s ending in which Letty wanders into a windstorm and dies. Sjostrom made three American films: He Who Gets Slapped (1924), The Scarlet Letter (1926), and The Wind (1928) before returning to Sweden and later starring in Ingmar Bergman’s classic Wild Strawberries (1957). The Wind is often credited as his best. The Wind is a powerful film with one especially haunting scene at the end in which Lillian Gish delivers her best performance. The Wind is a testament to the silent era, as one of its last great films next to The Passion of Joan of Arc. However, The Wind is also a dreary film and the quality is lacking in contrast to other great films of the 1920s.